Engine Codes: 188. We are constantly expanding our product range; developing and producing products to not just replicate OEM quality, but also to improve upon the original parts. Compatible with OE number:55187817, 55191646, 55191648, 71741294, 71741295, 71741296, 71741297, 71747608, 5623271, 5623272, 6 23 576, 93187861, 93187862, 93192650, 93192651, 562 321 6. Cylinder Bore 82 mm. Function Cylinder Sleeve. Height 112mm. Block Separation:, Engine Code: 185 A6.000. FIAT DOBLO Cargo (223) 1.9 D (223ZXB1A) Box Diesel 03/2001 on FWD 8 63 46. FIAT DOBLO Cargo (223) 1.9 JTD (223ZXE1A) Box Diesel 10/2001 on FWD 8 100 74. Recess Depth 1 [mm]: 12.410. Valve pocket depth 1 [mm]: 0.910. Valve pocket depth 2 [mm]: 0.910. MAINLAND -24 HRS. (incl: NORWAY & SWITZERLAND). FIAT GRE PUNTO (199) 1.3 D Multijet. FIAT DOBLO PLATFORMA / PODWOZIE (263) 1.3 D Multijet. FIAT 71729500. Function Piston. Recess Depth 1 12.400 mm. Valve pocket depth 1 1.200 mm. Height 88mm. Compression Height 40.430 mm. Engine Code: 199 A2.000. Engine Code: 188 A9.000. Recess Depth 1 [mm]: 12.400. Valve pocket depth 1 [mm]: 1.200. 14,000 positive. MAINLAND -24 HRS. (incl: NORWAY & SWITZERLAND). FIAT PUNTO (199) 1.3 D Multijet. FIAT PUNTO (188) 1.3 JTD 16V. If the item is used, we are unable to accept the goods back. Standard Size [STD]. If the item is used, we are unable to accept the goods back. MAINLAND -24 HRS. (incl: NORWAY & SWITZERLAND). Length 62,43 mm. Recess Depth 1 12,4 mm. Bolt Length 55 mm. We always will do the best for both sides to be happy! Standard Size [STD]. If the item is used, we are unable to accept the goods back. MAINLAND -24 HRS. (incl: NORWAY & SWITZERLAND). YOU TO CORRECT PARTS! Valve Pocket Depth 1 0,5 mm. Recess Depth 1 17,5 mm. Function Piston. Recess Depth 1 12.400 mm. Valve pocket depth 1 1.200 mm. Compression Height 40.430 mm. Engine Code: 199 A2.000. Engine Code: 188 A9.000. Engine Code: Z 13 DT. Engine Code: Z13DT. Oversize 0,6 mm. If the item is used, we are unable to accept the goods back. MAINLAND -24 HRS. (incl: NORWAY & SWITZERLAND). YOU TO CORRECT PARTS! Valve Pocket Depth 1 0,5 mm. Recess Depth 1 17,5 mm. Oversize 0,4 mm. If the item is used, we are unable to accept the goods back. MAINLAND -24 HRS. (incl: NORWAY & SWITZERLAND). YOU TO CORRECT PARTS! Valve Pocket Depth 1 1 mm. Recess Depth 1 12,4 mm. GOETZE ENGINE. Standard Size [STD] chassis number (VIN) and we will confirm the correct part required. Be aware that each model of vehicle may have a choice of few different part options. Such variations can apply due to upgrade designs on later chassis numbers, or the manufacturers using different OEM suppliers during production process. Thanks to years at the forefront of piston technology, the award-winning Nüral® brand can help engines to achieve more power with less fuel. Nüral pistons support engine efficiency by optimising performance in the challenging environment of the combustion chamber. Their expertise in engineering original equipment (OE) piston components directly benefits their aftermarket customers. Belt Tensioner Wheels & Bkts. Suspension Ball Joints. Windscreen Wiper Blades. Rear Lights. Front Exhausts Cats. Recess Depth 1 [mm]: 17.5. Valve pocket depth 1 [mm]: 0.5. Estimates can be provided beforehand but prices may differ upon ordering. Oversize 0,6 mm. If the item is used, we are unable to accept the goods back. MAINLAND -24 HRS. (incl: NORWAY & SWITZERLAND). YOU TO CORRECT PARTS! Valve Pocket Depth 1 1 mm. Recess Depth 1 12,4 mm. Standard Size [STD]. If the item is used, we are unable to accept the goods back. IN DOUBT WHETHER IT WILL FIT?. 14,000 positive. MAINLAND -24 HRS. (incl: NORWAY & SWITZERLAND). Valve Pocket Depth 1 1 mm. Standard Size [STD]. If the item is used, we are unable to accept the goods back. IN DOUBT WHETHER IT WILL FIT?. 14,000 positive. MAINLAND -24 HRS. (incl: NORWAY & SWITZERLAND). Length 62,43 mm. Recess Depth 1 12,4 mm. Cylinder Bore [mm]: 70. Replaces following reference(s) (We can mark the item as a 'gift' if requested to, but we will not declare any different amount). Machined: with cut-out for oil jet. Safety & Workwear. Belt Tensioner Wheels & Bkts. Suspension Ball Joints. Windscreen Wiper Blades. Rear Lights. Front Exhausts Cats. Recess Depth 1 [mm]: 12.4. Valve pocket depth 1 [mm]: 1. Estimates can be provided beforehand but prices may differ upon ordering. Cylinder Bore [mm]: 69,6. Replaces following reference(s) (We can mark the item as a 'gift' if requested to, but we will not declare any different amount). Machined: with cut-out for oil jet. Length [mm]: 63.430. Piston rings for large bore engines are our specialty. They are fully dedicated to this technology and can offer everything from a single source: from R&D to the production. Standard Size [STD]. If the item is used, we are unable to accept the goods back. IN DOUBT WHETHER IT WILL FIT?. 14,000 positive. MAINLAND -24 HRS. (incl: NORWAY & SWITZERLAND). Valve Pocket Depth 1 0,5 mm. Standard Size [STD] Then at our discretion we will decide the next course of action. There may be on occasions more than one compatible part for your vehicle. Faulty Products. Component No. But it is really rare situation. Fiat Croma, Grade Punto, Multipla, Stilo ( 1,9 JTD). 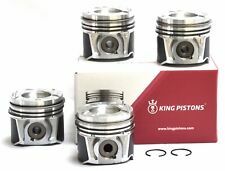 PISTON FIAT 1,9 JTD 2,4 JTD. Fiat 939 A 1,000, 8,000 186 A, 192 A 1,000, 937 A 7,000. Piston pin: 25,988 x 61 mm. Motor skills for over 70 years - also for you! PISTON & RINGS SET. PISTON RINGS: 2.0 / 1.5 / 2.0. PISTON LENGTH: 62.43. This piston is standard size. TECHNICAL DATA SET INCLUDES EVERYTHING THAT IS SHOWN ON PICTURES. PRICE FOR 1 CYLINDER ONLY. PISTON FIAT 1,9 JTD 2,4 JTD. Fiat Croma, Grade Punto, Multipla, Stilo ( 1,9 JTD). Lancia Lybra, Thesis ( 1,9 2,4 JTD). Piston pin: 25,988 x 61 mm. The indicated original manufacturers and part numbers are only for comparative purposes. Glyco connecting rod kit FIAT 1.3JTD 16V 03-. Part Manufacturer:GLYCO 55-4077 SEMI. FIAT DOBLO Cargo (223_) VAN / VAN 1.3 D MULTIJET 75 HP 199 A2.000 2005.10-2010.01. FIAT DOBLO Cargo (223_) VAN / VAN 1.3 JTD 16V MULTIJET 84 HP 223 A9.000 2006.08-. (Fiat Doblo, Punto, Idea, Palio, Panda II, Punto 1,3 JTD 16V). PISTON FIAT 1,3 JTD 16V. Fiat 188A 8,000, 9,000 188A, 199A 2,000. Piston pin: 23 x 56,50 mm. EAN 4028977586903. Motor skills for over 70 years - also for you! Part Manufacturer:MAHLE 010 20 N0-4. FIAT 500 (312_) HATCHBACK 1.4 100 HP 169 A3.000 2007.10-. FIAT 500 C (312_) CONVERTIBLE 1.4 100 HP 169 A3.000 2009.09-. BODY STYLE. FIAT BRAVO II (198_) HATCHBACK 1.4 90 HP 192 B2.000 2007.04-. Original Fiat flask Nüral. Fiat Lancia 1.3 D Multijet, OPEL 1.3 CDTI. 1 x Piston without bolts Zyl.Bohr. Enter your key number to 2.1 and 2.2. We motors Plass team are looking forward to your call.